These issues can be solved by AIVA CONSTRUCTION PROCESS MANAGEMENT PROGRAM. It helps to automate the work of all construction company units, combining them into a single system that uses a single database over the Internet. 3) Further project management, - works, supply of materials, subcontracting, mechanisms performed directly from the project schedule, therefore project management takes place with much less time and execution process is reflected in the project's Gantt schedule. 9) Calculation of employee wages and salaries due to the work done in the work management has been realized. 10) All project planning and financial accounting is done in real-time, which makes it easy for company managers to monitor project implementation and ensure that projects do not delay or exceed their estimates. 5) Better control means less loss of time due to project failure. Our solutions are suitable for various construction companies, which carry out general construction works, perform repairs of buildings, road builders and specialized companies performing ventilation, electrical installations, etc. works. We have installed AIVA CONSTRUCTION program in both small and large companies. E-marketing to find new customers. All customer inquiries and contests are registered. Planning of future contact with customers. Creating estimates or importing them from a file. Gantt chart, a project plan, is formed from the project's estimate. The chart calculates and displays expenditure, income, workers. The management of the project is reflected in the expenditure graph. Graph features: joining and division of work, section forming, filtering, printing, etc. Price inquiry for making a commercial offer. Price survey after making a contract. Forming queries for the surveys of prices from the project's estimate. Price inquiries online - suppliers and subcontractors input their prices online. Conversion from price inquiries to purchase orders. Using the data from the project's plan, the software creates queries for the supply of materials and machinery to the site. The manager only has to specify the query. The queries are confirmed by the supply manager and are passed on to a) purchasing, b) transfering from the central warehouse c) price survey. After the delivery of materials (machinery), the project manager compares the goods with the query and confirms the delivery. Our construction inventory software helps you control stock levels efficiently. Manage tools, materials, and assets across locations with ease. Accounting for materials as received using project's queries and orders to suppliers. Using the Gantt graph, the program creates weekly tasks for the workers. 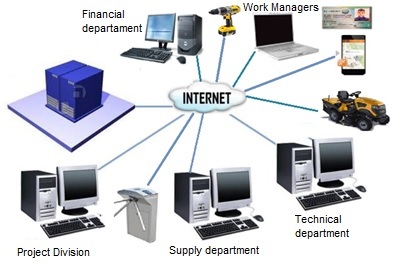 The job manager can distribute jobs among days, assign workers and mark the task as completed. Completed tasks are shown in the Gant's schedule next to the scheduled tasks, from which the program calculates and forms the accumulated monthly report of the project and calculates the salaries of the workers. Use of RFID scanning for delivering or returning tools. Accounting for the transfer of tools to users. Application for tool trasfer. Document registers. Document registration, search, transfer to execution, supervision of execution. Financial accounting. Import/export to bank.